What is 3 Rivers QUEST? More Water Quality Parameters, Visual Assessment Data, and More! 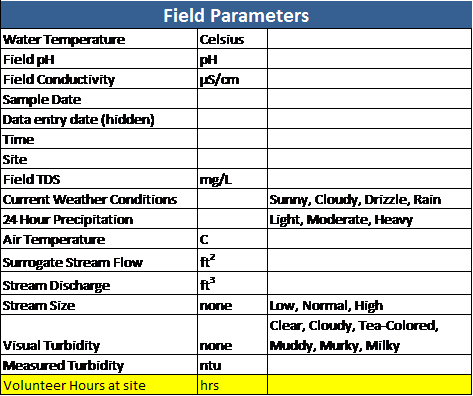 Knowing the importance of volunteer collected data, the West Virginia Water Research Institute set out to develop a truly secure and scalable database that volunteer organizations could use, not only their participation in the 3RQ program, but also for their own water quality data management needs. The original QUEST Data Management Tool allowed for the capture of three water quality parameters – pH, conductivity, and water temperature. The NEW and IMPROVED QUEST Data Management Tools will allow for the collection of various field parameters as well as chemical parameters. In addition to these already implemented updates, several other improvements are also in the works. Namely, a Visual Assessment Tool that and the ability to upload data logger data. Anticipated incorporation of these additional components will be in the coming months, with a target release date of Spring 2013. 3RQ Program Manager Melissa O’Neal for more information. To Jason Fillhart, an Environmental Specialist at the West Virginia Water Research Institute, a day in the field, even when temperatures are approaching freezing, is better than a day in the office. During the week Nov. 5th, Jason and 3RQ Volunteer Coordinator Glenn Waldron headed into the field to conduct the second round of free water sampling with subsequent lab analysis on behalf of QUEST Volunteer Organizations in the Monongahela River Basin. The free service will provide a much more in-depth look at water quality at sites watershed groups are monitoring on a regular basis as part of the 3 Rivers QUEST program. The next round of sampling will be taking place in the coming months. If you watershed group is interested in learning how to get involved with the 3RQ program, contact us! Protecting water resources while providing a vital energy future will be the main focus when researchers, policy makers, regulators, and agency representatives converge on Morgantown Oct. 30 and Oc.t 31 for the West Virginia Water Research Institute annual Water Research Conference at the Waterfront Place Hotel. To keep up with the latest technology, increase functionality and to allow the Mon River QUEST program to grow and expand, we are very excited to launch a new, interactive data map! Using programming from ESRI’s ArcGIS Explorer, this site will be better able to display data in a manner that provides users with the ability to visualize the water quality of the Monongahela River at given locations or times. New Data Maps Coming Soon! New and improved Data Maps are coming to the 3RQ website soon! WVU is an EEO/Affirmative Action employer — Minority/Female/Disability/Veteran.